Electronic Arts Inc. have announced that EA SPORTS™ is developing FIFA 13 a for Nintendo Wii U™. 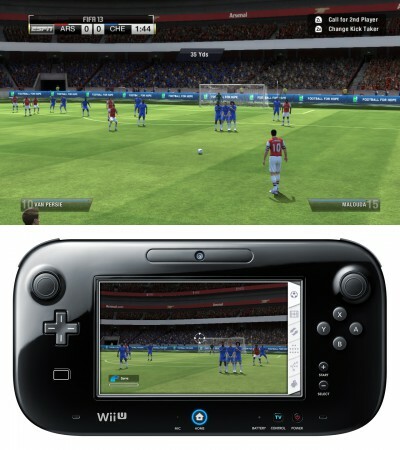 Featuring award-winning gameplay, HD graphics and new ways to play, FIFA 13 promises to be incredibly innovative on the Wii U and it will be in stores around the world when the new console launches. Check all details and screenshots here. EA SPORTS delivers its best football game ever on a Nintendo console with award-winning gameplay—including the Player Impact Engine—HD graphics, and over 500 officially licensed clubs. Three revolutionary new ways to play bring players of all abilities together, making this the most accessible FIFA console game ever made. Families can play together in Co-op Mode, where one player manages and up to four others play. 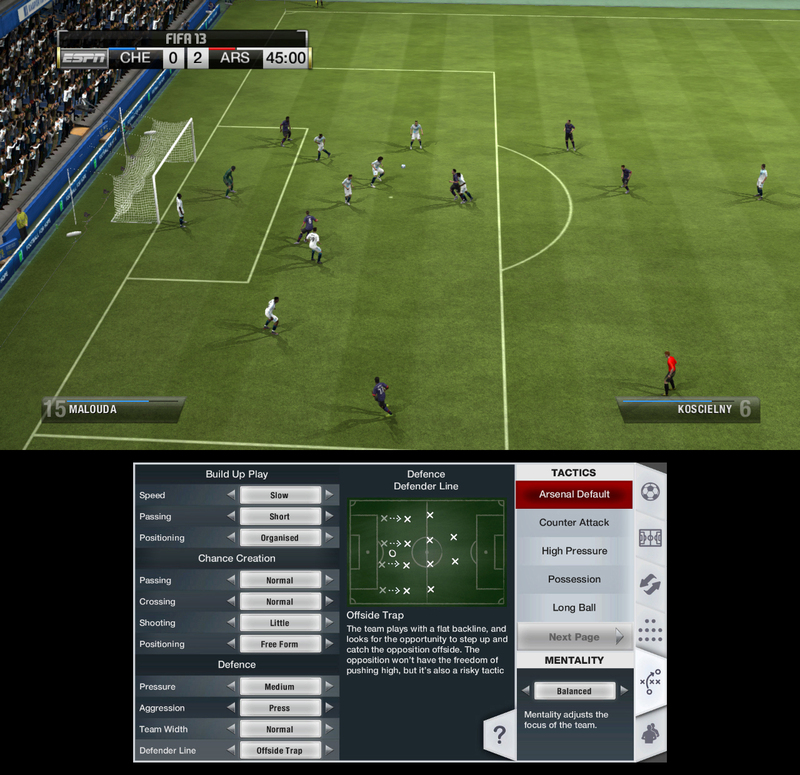 Team Management Control features interactive radar to send players on supporting runs, attacking or defensive, and touch screen control to change tactics, formations or subs on the fly. Experience the thrill of managing your favorite football club in Manage Match, directing players from the sidelines and even giving half-time talks. 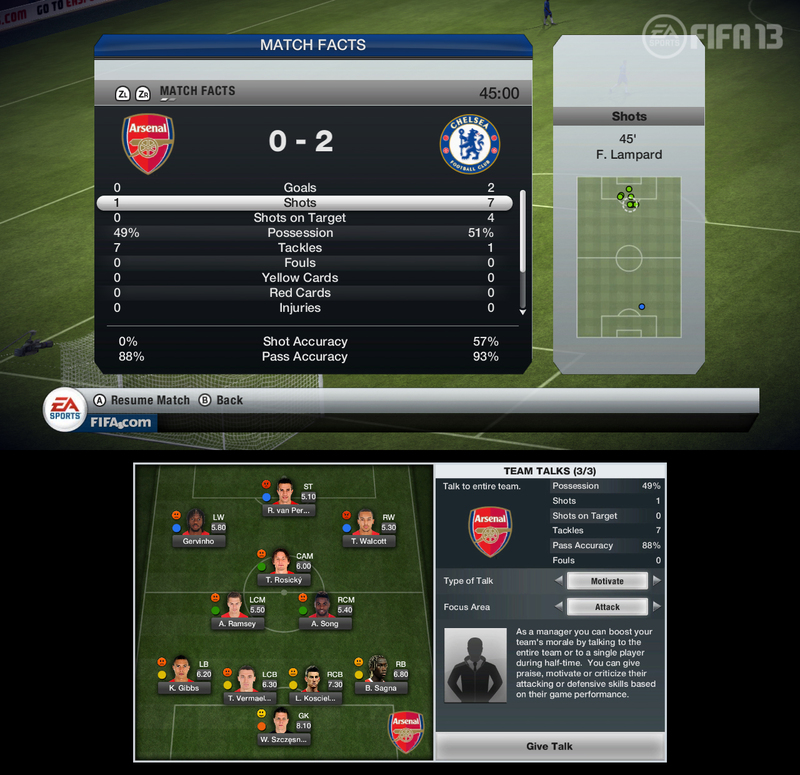 Plus, view a statistical analysis of the match and any player at any time. 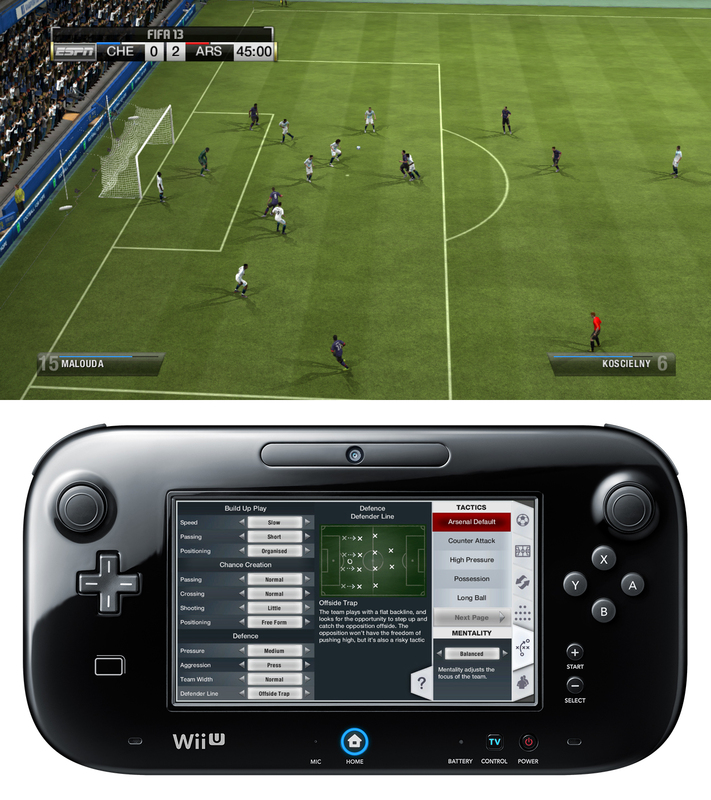 Innovations that utilize the Wii U™ GamePad put you on the pitch and immerse you in the action. Lift and look through the GamePad touch screen to aim the ball on set pieces and penalty kicks, then put the perfect curve on your shot and let it fly. Shake the GamePad to activate Touch Screen Shooting, removing the element of ‘hit and hope’ and allowing for pinpoint accuracy. 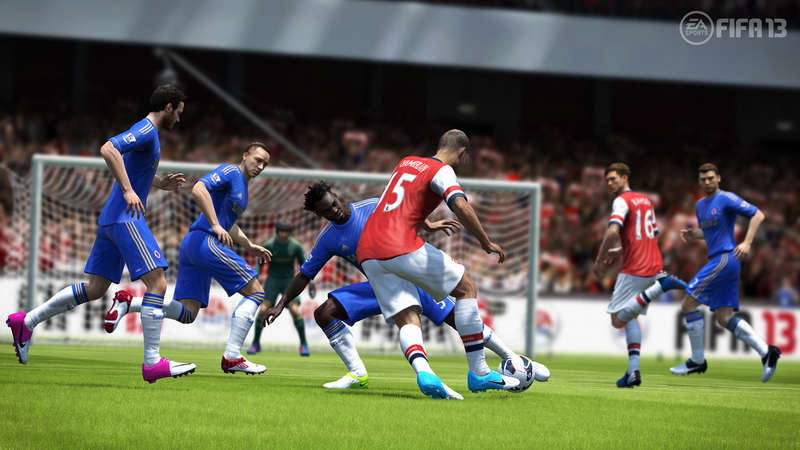 Plus, connect and interact with friends like no other FIFA title. See your friends online and invite them to play, or message them in real time using touch screen typing. 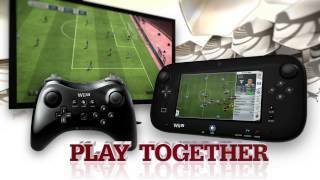 Award-winning Gameplay Enjoy the award-winning FIFA franchise gameplay optimized for Wii-U. The Player Impact Engine delivers real-world physicality in every interaction on the pitch with an infinite variety of natural and believable outcomes in every contact. Utilize Precision Dribbling to take on opponents 1-on-1 with the touch to be creative in tight spaces on the wings and even while fending off an opponent. 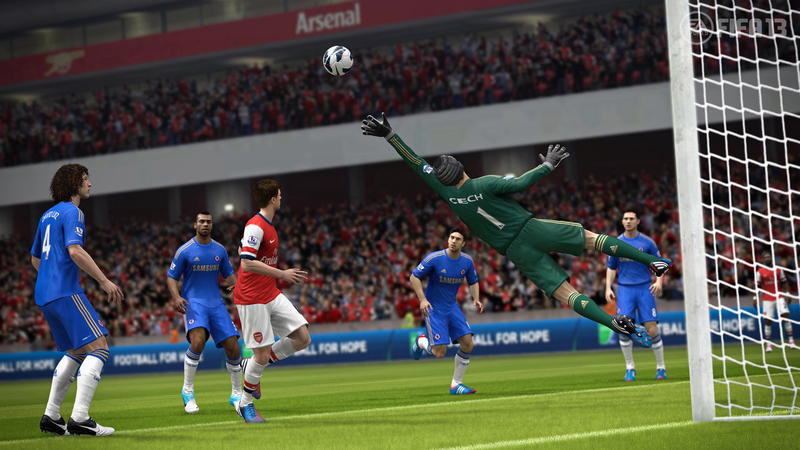 Lift and Look See the game from the player's on-field perspective and enjoy creative new ways to take free kicks and penalties. 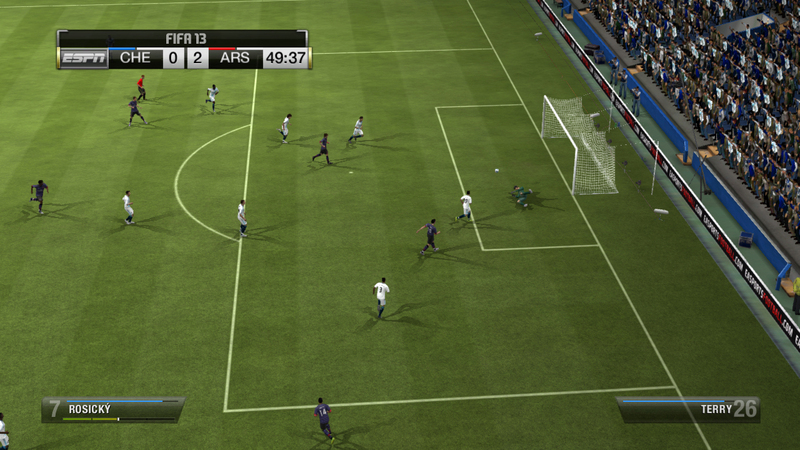 Simply lift and look through the GamePad screen to aim the ball put the desired curve on the shot and let fly. Look to see which teammates are positioned for more dangerous opportunities. Shake and Shoot Enjoy complete control of shooting; the most rewarding part of football. 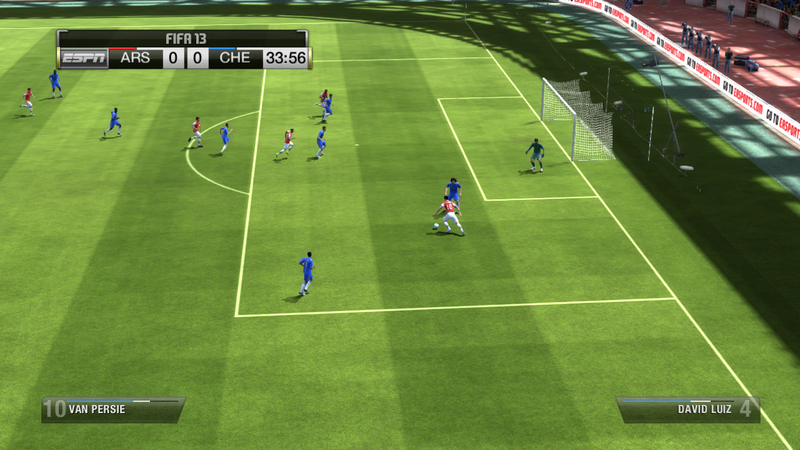 Shake the GamePad to activate the shooting zone and touch the screen to pick a spot precisely on goal and fire away. Tap and Tackle Take control of a specific defender by tapping on the player using the touch screen and taking all the guess work out of auto switching. 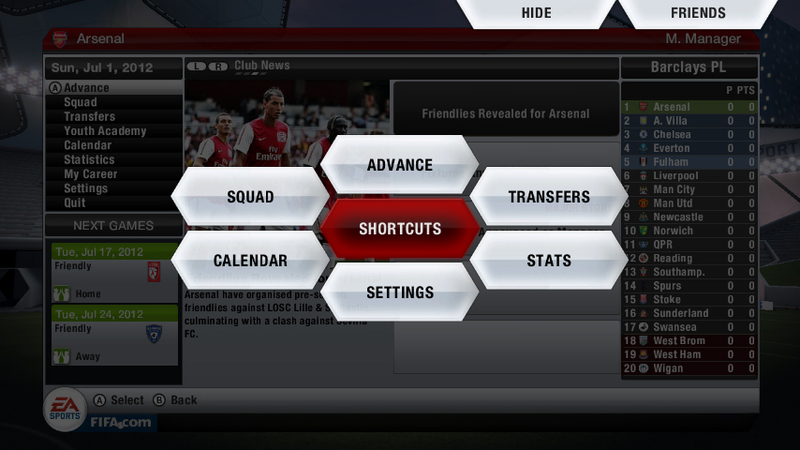 Use the touch screen to man mark or tackle and opponents simply by tapping on the attacking player and watching your closest defender mark or tackle him. Precision Passing Be more creative on the pitch making decisive passes with precision and long balls with ease utilizing the touch screen. Play Together You decide how to play; hands-on; manage; or play and manage. One player manages while up to four others play in Co-op Mode. 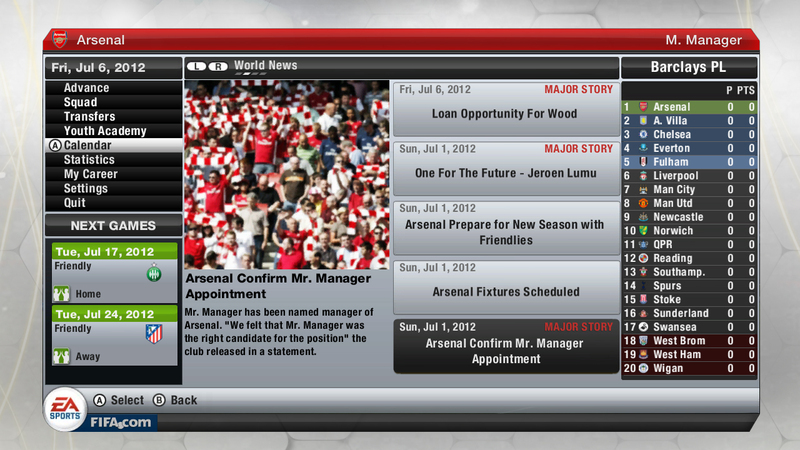 Available in Exhibition Match; Tournaments and Career Mode. Connect with Friends Use the Friends Tab to interact with friends while playing the game. See friends online and message with them quickly and easily using touch-screen texting. 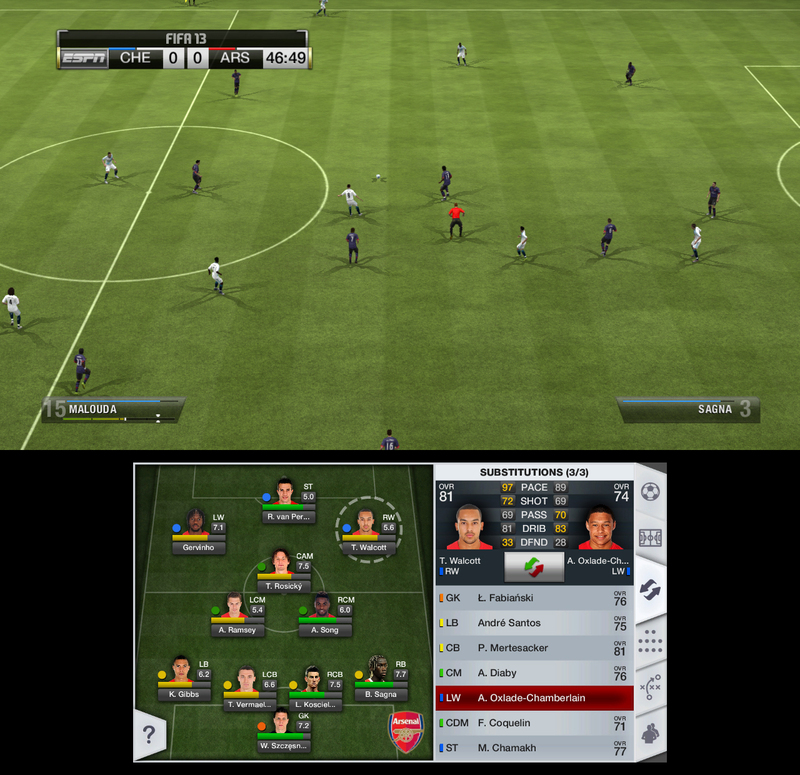 Complete Control Full Team Management Control on the GamePad lets you change formations; make subs; switch player positions; change every facet of a team's tactics; and even set man markers all without interrupting the game. 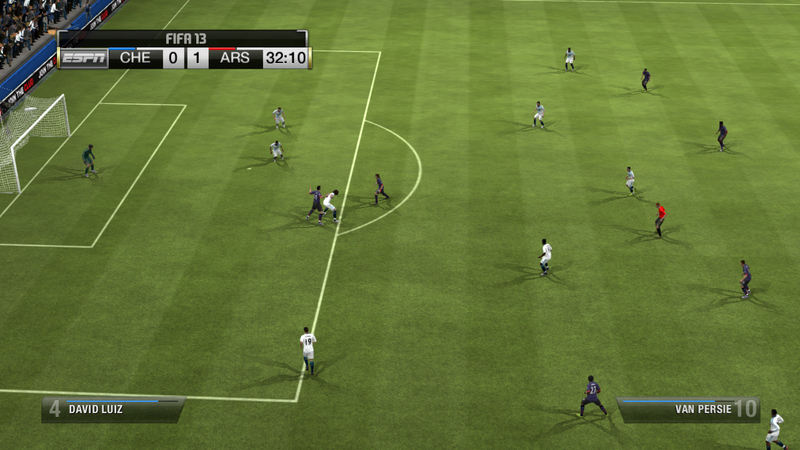 Use the Interactive Radar to control all of your players on the pitch. Make your own defined defense splitting runs or get defenders to track back on defence. 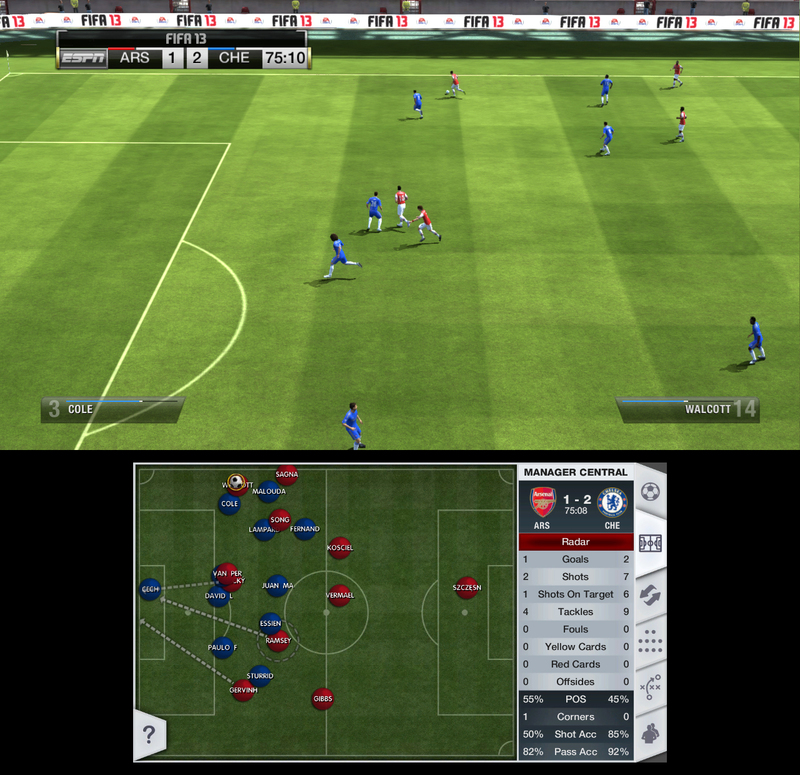 Manage the Match Take the reins as the manager and watch the game unfold; making key strategic real-time decisions using the GamePad. Make half-time team talks and try to motivate key players. Gamers can chose to manage the team in all of the main game modes; including Tournaments and Career; and can even intervene and take control if the outcome is in doubt. Manager Hub Analyze the match by looking at match or player specific stats to help make managerial decisions. 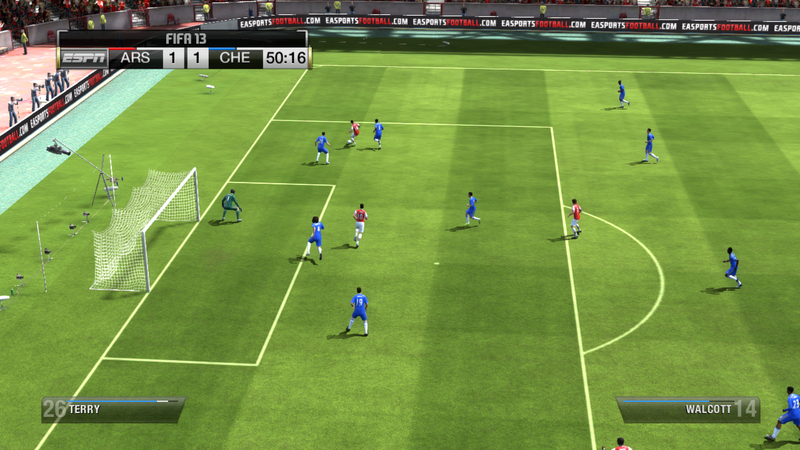 Tap on any player to get full statistical analysis; including the opposition. See who's having a great game or who is having a shocker. See where all the shots are being taken from to know where to strengthen or who to man mark. 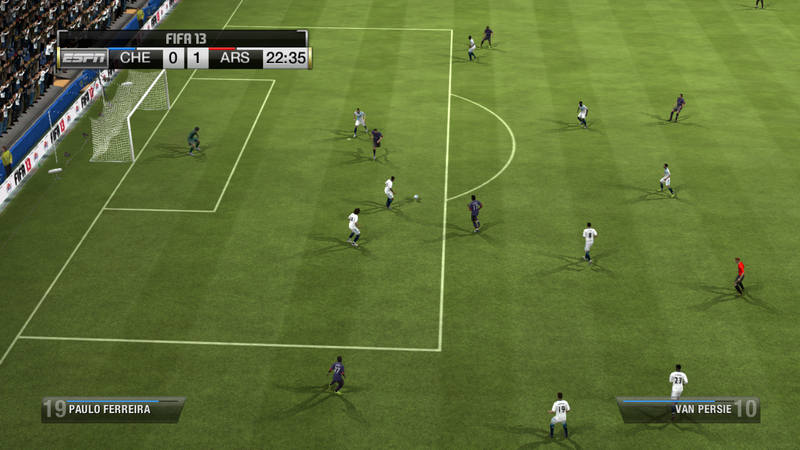 See a player's performance stats and even their energy to help you make more informed substitutions. Real-World Drama Experience the same drama and storylines as the real world of football; either as a player or manager; with their consequences being played out on and off the pitch in Career Mode. See storylines play out in the press; experience the emotion and urgency of Transfer Deadline Day; and discover new talent using the scouting network. Go Online Compete in ranked online seasonal play with promotions and relegations. Play 10-game seasons and earn enough points to be promoted or avoid relegation. Higher divisions mean better competition. Compete for Cups and in dynamic tournaments. 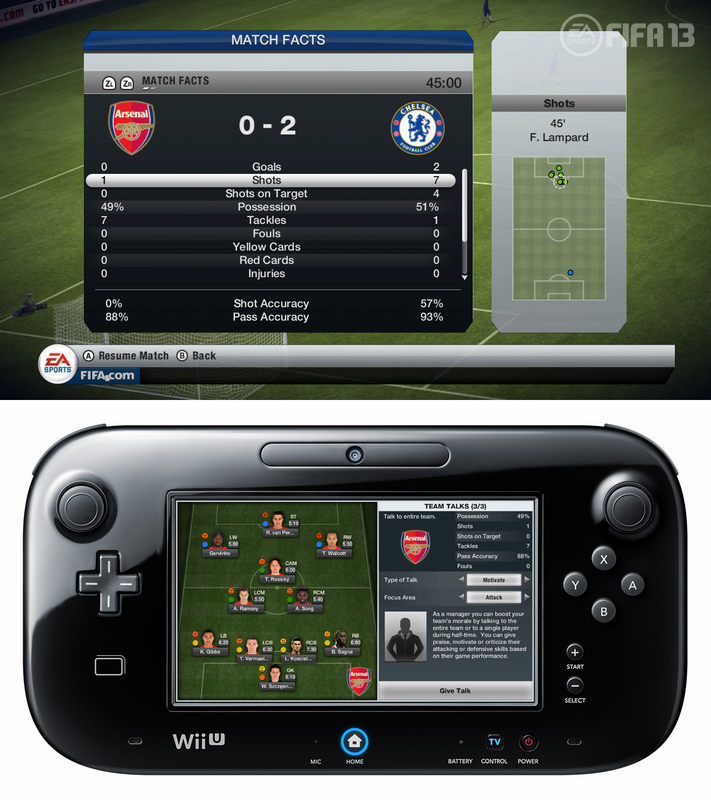 Touch Screen Navigation Utilize the Gamepad to quickly select your favourite game modes and features. A much simpler and quicker way to get to the action. Complete Authenticity Compete with over 500 officially licensed clubs in 11 v 11 matches in authentic stadiums from around the world. 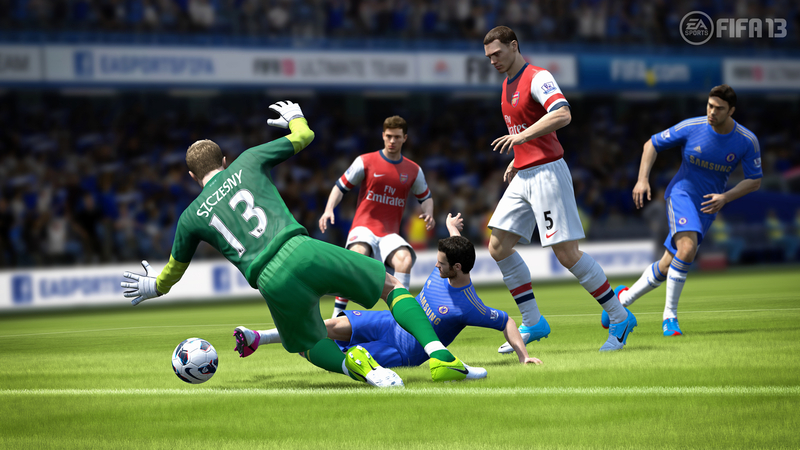 HD Graphics Stunning player models; graphics and animations in High Definition. 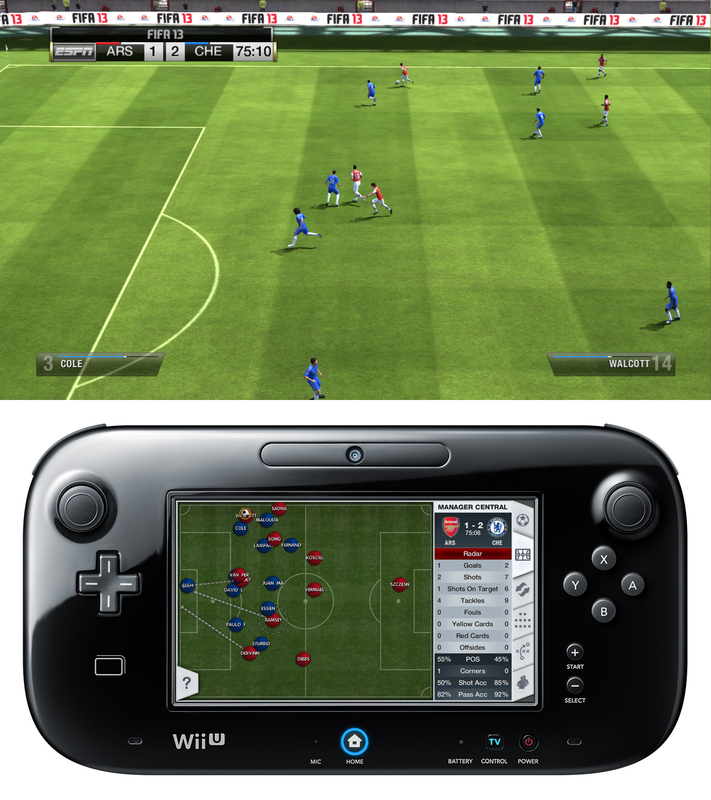 Also check out our partners at FIFA Soccer Blog’s FSB’s FIFA 13 – Wii U Preview after they were lucky enough to play it when the recently visited EAC.